Every generation has a date in history that they will never forget. 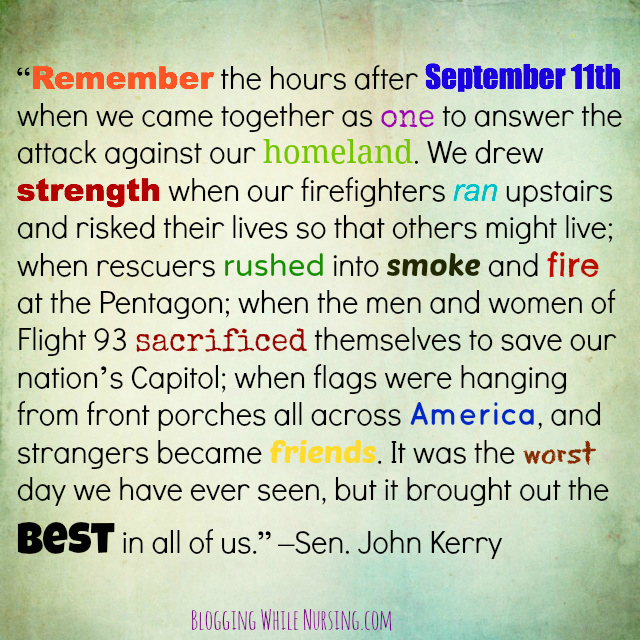 For two generations before us it was Dec. 7th, for our generation, it is Sept. 11, 2001. It doesn’t matter how many years have passed, it is the same for most of us. We remember, we cannot forget, and there are times during this day that we cannot stop looking up at the sky. My prayers goes out to families who have lost their loved ones on this day, and every day after this tragic event. My prayers are with the service men and women who signed up to defend our country on all fronts, and those who made the ultimate sacrifice doing so. 13 Comments on "9/11 Never Forget"
My prayers goes out to the families that lost a loved one. I hope they find peace its hard though even after years have gone by its still there the reminder of it all. Even though the years rolls by, the families affected will never forget. They can use all the prayers and hopes for fortitude. Can’t believe it’s been 12 years. I know. It does feel like it just happened yesterday. Even though it was 12 years ago, we can relive it in our minds as if it was just yesterday. I remember everything for sure. I love the way you did this. I hadn’t posted to any social media til now. Pinned this. Praying with you & no, this generation WILL NOT ever forget! Thank you so much Joi for pinning this. And nope, we will never forget. A dozen years sounds like awhile ago, but still the wounds from that day are so fresh. For many, those wounds will always be raw, which is sad and terrible and all things awful. I marvel at the courage and fortitude that we’ve seen in the following days, weeks, months and years as they tied to 9/11 and hope that though it often doesn’t feel like it, that we keep trying to pull together as a country because as I mentioned on my blog earlier, togetherness is essential and we need more of it. I agree with you 100% togetherness is essential and we do need more of it for sure! I am still amazed at the images of those brave men and women who ran towards the buildings when everyone was running away. How moments before, they had their pictures taken, and then next moment gone. Everyday I send a prayer to the families that lost their loved ones and that they did not die in vain. Hi Kalley! Time sure has flown by…can’t believe it has been 12 years now. Like every major event that has happened in our country…every person can remember what they were doing at that exact time. We will NEVER forget! Thanks for sharing and thanks for linking up! It feels like time is slipping away, I can’t believe that it’s really been more than a decade. It is truly an unforgettable day for us. Blessings and take care! I don’t think the impact will ever diminish. Even now, when I see and experience a near perfect September day, my mind goes back to seeing that black cloud of smoke billowing up from the Pentagon. And being scared to stay in DC, but even more scared to drive home to Maryland.